MANILA – The tandem of Julia Montes and Coco Martin will temporarily have to take the backseat as the actress is set to be paired with a new actor in an upcoming project. “‘Yung makaka-partner ko ...may additional so hindi ko alam kung sino ang bago. Hiwalay muna kami ni Coco,” she told ABS-CBN News. But Montes confirmed that actor Enrique Gil will definitely be part of this upcoming project. “Hopefully mag-start na 'yung story conference. Wala pang title pero may mga nasasabi na sa aking makakasama ko. Si Enrique is parang sure na,” she said. Without saying whether it is going to be a new movie or a television series, Montes said their first story conference is set in April and that’s when she’ll know more details about the project. While waiting for new opportunities to come her way, Montes said she will first spend quality time with her mother this coming Holy Week break. Montes and her mom will be flying to Thailand on Tuesday for a four-day vacation in Bangkok. She will be back on Sunday. I knew this but I'll confirm it. It will be Quen, Julia and Jake Cuenca. I am hoping it's just him and Julia! No more love triangles! I think it's okay na meron because feel ko siguradong siya ang makakatuluyan ni Julia. sana something Way Back Home ang Loveteam Concept wherein hindi na kelangan ng Love Triangle puro na lang the same kasi ang nakikita sa Philippine TV. I hope na Apat ang Lead cast Enrique, Julia, Jake and another girl Melissa or Shaina. Tas something Car Show/Lyrical-Contemporary Dance ang concept. 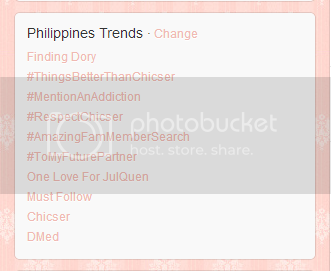 And they're still trending up to now, nationwide, on the 6th spot! Whole day trending na, ngayon pa kahit magmamadaling araw na. Now I'm really pumped up and am looking forward all the more to their upcoming project. Di pa nagsisimula e lakas na agad ng hatak. I read in some facebook pages that the title (working title most likely....) for JulQuen's teleserye is Hanggang Ngayon, can you confirm this ninong? Any news as to when this would start? Yeah, I've seen that in several sites as well..hm.. It's really astounding. I was aware of how a lot of people already supported them since Way Back Home pa lang, but I never expected them to trend one day after another, tuloy tuloy talaga, considering the fact that their teleserye hasn't even been released yet. There's no trailer pa nga, another factor. It's purely based on their chemistry. It's awesome. As for Jake Cuenca, I don't think there's anything wrong with them starring with him, as long as Quen and Julia end up together especially for Quen's sake. Plus, I think Jake would be able to help them improve their skills all the more and aid them as a kuya and as a seasoned actor. It would be epic. And because of these three, I can already feel the heavy drama coming. HANGGANG NGAYON daw ang title ng Julia-Enrique soap. Nabasa ko sa PEx na "Hanggang Ngayon" daw ang magiging title nito. and who said that erzo?